The chickens are doing great after the big scare at our house the other day. Ruby is on high alert, but we’ve been letting them hang out in our enclosed garden so there isn’t the threat of a fox. 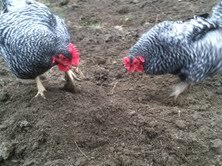 Plus, they’re turning over the soil and getting paid in worms. Win-win. Scratch-Scratch. This week we’ve been lying low. Renting movies like J. Edgar, making lazy dinners like scrambled eggs, and eating way too much leftover Easter candy that my sister-in-law gave to us. Being reacquainted with Sprees and Cadbury mini eggs is killing any health kick I thought I was on. Who am I kidding?! The Gelato Fiasco I found in my grocery cart isn’t helping things on that end either. And I admit that I didn’t find it in my cart; the proper word would be placed. Tomorrow I Juice. Or at least drink kale smoothies and try to undo this voodoo. Anyone else OD’ing on sugar these days? How about dog sitting?